I was lying in bed with my laptop when the email arrived; a simple little bing. I flipped over to see what my phone wanted now (I am its slave and live only to do its bidding). An email from Liiga—with a first proof! I couldn’t open it fast enough, and as excited as I was, I was entirely unprepared for what happened next. I felt it. From my stunned eyes to my curling toes. A shock thrilled through me, tightened my chest, stole my breath. I’m a writer. I exaggerate—especially in writing—but I’m not exaggerating here. I’ve never been so physically affected by any art as I was by seeing my character, by meeting the man I’d walked and talked with for over thirty years. I will never forget that moment. I will never forget how it made me feel. That file was labeled as proof nine. I didn’t see all of them along the way, maybe four. Finally, around the Ides of November, proof number twenty-three arrived. I opened it and stared. It was beautiful. It was everything I wanted, even when I didn’t know it. I’m was staring at it expanded as large as my 27-inch screen would allow when my husband walked in. Someday, I hope you will get to know my character, that you will walk with him through In a Mortal Shadow, that you will care about him enough to journey with him through his entire story. 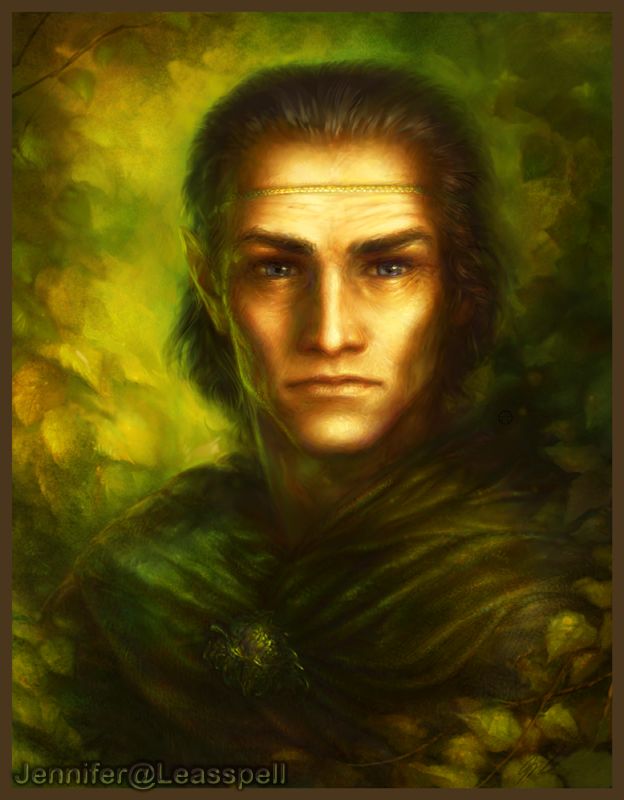 Today, allow me the pleasure of introducing to you my most beloved character: Falion of the House of Yon. (Link to site or list as https://leasspell.net//jennifer-at-leasspell/). Character Sketch—Falion is a half-elven commander who wants what every other Elvish, Starrish, and Human person in Indirian takes for granted: control of his own mind. But he is cursed by his mixed-up heritage to succumb to others’ perceptions at the briefest touch. He has retreated to an insignificant village to live his life behind the weave of his clothing and the leather of his gloves. He might have lived out his days training farmers to resist the raids plaguing them had they not captured her, the Starrish leader of the raiders who killed his gerent’s son and abducted his daughter. Falion sees one chance to find his lord’s child: take the woman to be truthread in Lumiden where the Elvish people live—a place where Falion is no longer welcome. From one Jennifer to another: Thanks for dropping by and sharing my character’s moment in the digital sun. Lovely! I know what it’s like to get a thrill from writing, I do it all the time. Your character seems interesting, and as the other Jennifer said he is quite pleasing to the eye! Then again, I’ve always had a thing for elves or vampires especially those with long hair and complicated backstories. Go figure! Hello handsome, he looks great, just like I imagine him. And who ever heard f an elf who wasn’t complicated? !